Heat oven to 425°F. Spray large cookie sheet with cooking spray. Unroll pizza dough; place on cookie sheet. Starting at center, roll or press dough into 15x10-inch rectangle. Sprinkle cheese down center third of dough. Spoon onion mixture evenly over cheese. Bake 11 to 15 minutes or until crust is golden brown. Let stand 5 minutes before serving. Remove from cookie sheet; cut crosswise into slices. Mozzarella or fontina cheese can be used in place of the Asiago. 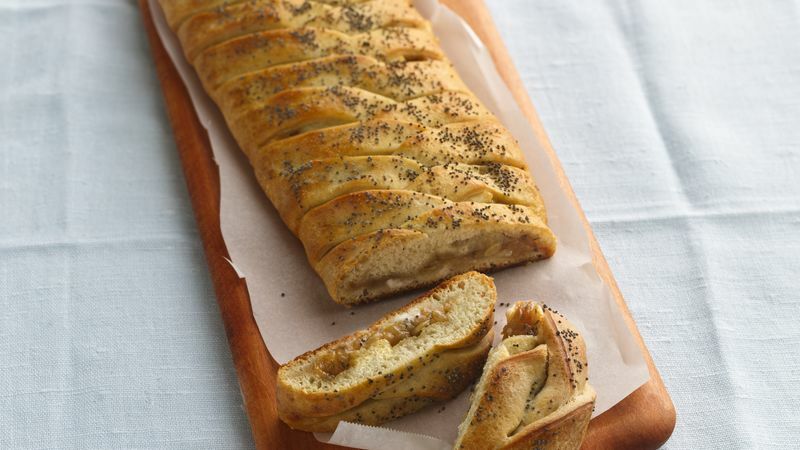 Serve this braid as an appetizer or alongside a soup or salad.